The sternocleidomastoid is the most prominent structure and muscle in the frontal and lateral view of the neck. It takes its onset from the sternum and the clavicle and connects to the mastoid, located dorsal of exterior auditory tube. The three muscular structures (above black marks) arising from the medial part of the clavicle and sternum are all part of the sternocleidomastoid. 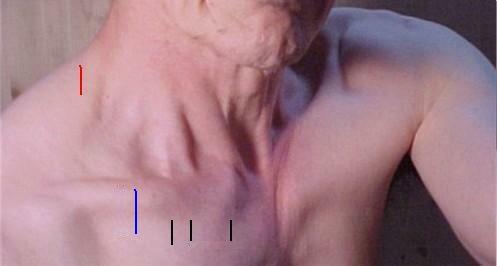 In-between sternocleidomastoid and the border of trapezius (below red mark) presents the omohyoid (above blue mark), a muscle connecting hyoid and scapula.